On Saturday 19 January the Lewis Walpole Library facilitated a visit to the exhibition Lost Treasures of Strawberry Hill by the Yale Club of London Art Circle. A group of 20 members were entertained with an initial reception, introduced by E.C. Schroeder, the Librarian of the Beinecke Rare Book and Manuscript Library, and Michael Snodin, the curator of the exhibition. Michael then led a tour of the exhibition, in which he and research curator Dr. Silvia Davoli had assembled some 160 exhibits from over forty lenders, many of the loans from private collections. Thirty of those loans are from the Lewis Walpole Library. 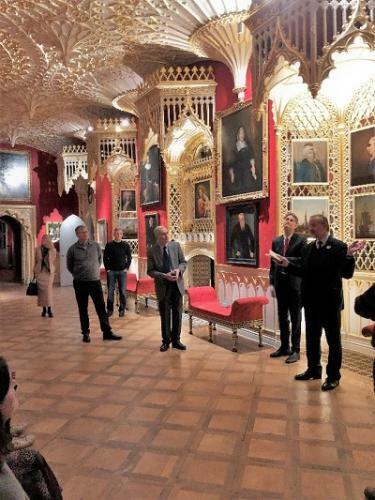 The Yale Art Circle were privileged to enjoy a private tour of Strawberry Hill, all the more atmospheric for being conducted after dark, with treasures by Holbein, Van Dyck, Reynolds, Grinling Gibbons, Boulle, and a host of other masters displayed. The exhibits reflected the range and importance of Horace Walpole’s collection, from a magnificent, animated first century A.D. Roman marble carving of an eagle, and wonderful historic portraits and miniatures, to works of art commissioned by Walpole himself. The exhibition continues until 24 February. The Lewis Walpole Library is proud to have been a major donor to this important and very well-received event. “On behalf of the Yale Club of London Art Circle, I would like to thank you for not just introducing us to Strawberry Hill but making possible such an extraordinary experience for us. E.C.’s introduction to Strawberry Hill and Horace Walpole by way of the Lewis Walpole Library and the Yale connection was both enriching and stirred the alumni spirit, and Michael’s guided private tour through the house shrouded in the darkness of winter was like time travel. For many of us, it was our first visit to Strawberry Hill but certainly not our last, and those who had been before marveled at what a difference reuniting the collection with the home had to the atmosphere. Our only regret is that you weren’t able to be with us on Saturday. Your efforts have made amateur Walpolians of all those present. I really would not be surprised to learn if your visitors in Farmington by way of London increase exponentially in the near future!